Jen-Hill is a full-service Liner installation and repair company. Since 1987, we’ve been installing HDPE, LLDPE, Polypropylene, and Geosynthetic Clay Liners(GCL) liners in TN, and a five-state area. 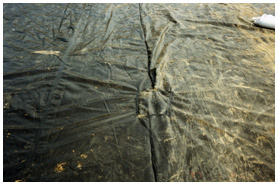 Additionally, we service the liners manufactured or installed by others. Our liner construction and repair manager is David Hines. He is a highly trained professional and manages a group of excellent technicians. Jen-Hill has laid over 10 mil square feet of liner and serviced or maintained close to that amount.